Avocados grow most effectively in very warm, temperate climates. Mexico produces more avocados than anywhere else on earth. Mexico is the world’s largest exporter of avocados. The country exports nearly US$2 billion worth of avocados representing 47% of the global exports. The Netherlands is Europe's largest exporter accounting for 11.2% while Peru and Chile export 9.3% and 8.4% respectively. The United States exports $128.7 million or 6.3% of the global exports while Kenya is Africa’s largest exporter with a market share of 2.3%. There are three main types of avocadoes named for where they originated from. They vary in size and amount of oil. 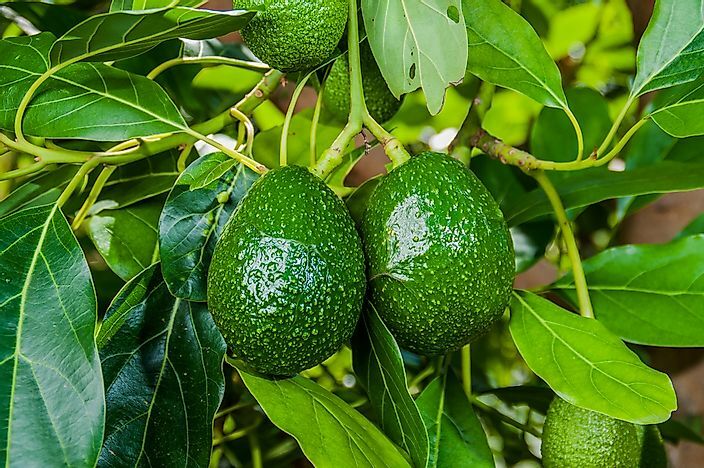 The Mexican avocados have the highest oil content but are the smallest while the West Indian avocados have the least oil content but are the largest. The Guatemalan avocados have an average amount of oil and size. Avocadoes are tropical plants that grow in tropical climates. The most limiting climatic condition to the growth of avocados is cold weather. The optimum temperature is between 68 to 75 degrees. The Mexican avocados are the most resilient to cold climate but can only sustain temperatures of up to 24 degrees Fahrenheit. The West Indian varieties cannot tolerate temperatures above 34 degrees Fahrenheit while the Guatemalan varieties tolerate temperatures up to 34 degrees. Temperatures of above 100 degrees F with low humidity damage avocado plants. The avocado tree can grow in a variety of soil types with varying alkaline levels. However, the soil must have good drainage. The West Indian varieties are the most tolerant to salt and are more likely to grow in the coastal regions. The best avocado tree planted by large-scale farmers is the Mexican variety grafted to the West Indian rootstock. The avocado tree does not tolerate wet soil but needs about an inch of water weekly. It is recommended not to fertilize the tree until it is a year old. After the tree begins to produce fruits it is recommended to use a high-nitrogen fertilizer during late winter and early summer. An avocado tree needs to cross-pollinated to successfully produce fruits. Although the avocado plant has both the male and female flower parts, they open up at different times of the day thus preventing pollination. Farmers need to plant type A and B varieties for successful pollination. A single plant grows as a specimen but cannot yield fruits. The best place to grow the plant is in an open field that allows cross-pollination by wind or insects. This page was last updated on October 25, 2018.